Marion Dhein writes to Martha Berry to thank her for sending a baby blanket to her newborn daughter, Shirley. She reflects on the year she spent on campus and on her time at Sunshine Cottage. 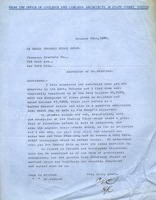 A Coolidge and Carlson letter with the initials of Harry J. Carlson discussing the inspection of buildings at Berry College. In general the buildings are satisfactory. Thompson Starrett has been given a list of issues and may receive an additional list from the donor's engineers. Concerns about asphalt stair treads are discussed and Thompson Starrett is given instructions about insurance on the buildings.